I heard earlier today that Melvin Sparks had passed away from heart failure, just days before his 65th birthday. Sparks was not well-known, even in jazz circles, so I figured that I would tell y’all a little bit about him. Sparks was a good guitarist who was most active during the soul-jazz heyday of the late ‘60’s and early ‘70’s. He was on many of the Prestige Records albums of that time and even on few Blue Note dates. If you dug Lou Donaldson’s Hot Dog, Lonnie Smith’s Think!, Charles Earland’s Black Talk! or Rusty Bryant’s Soul Liberation, then you’ve probably heard Sparks’ bluesy Grant Green influenced playing. He dropped a few projects under his own name during the early ‘70’s as well; all very much within the groovy soul-jazz vein of the era. The best of these were his debut Sparks! with Houston Person and Spark Plug, which featured a young Grover Washington, Jr. on tenor. Here’s “The Stinker” from Sparks! In the so-called “Acid Jazz” era of the ‘90’s, Sparks underwent a bit of a career renaissance. Sparks! and Spark Plug were compiled on one CD as a part of Prestige’s Legends of Acid Jazz series, which got him some new attention. Sparks then recorded his first sides as a leader in almost two decades (most for Savant Records) and as the work came again for the other old soul-jazz cats, they gave Sparks a call. During the ‘90’s and early 2000’s he backed Donaldson and Earland again; as well as Jimmy McGriff, Hank Crawford and relative newcomer Joey DeFrancesco. He was still going strong until recently, bringing joy to multiple generations with his still nimble playing, as you can see in the clip below. He was a part of an era of jazz that many people unfortunately, try to forget. 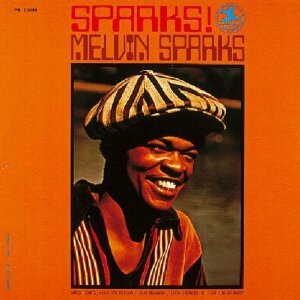 But Melvin Sparks should be remembered. This entry was posted on March 16, 2011 at 4:26 pm and is filed under In Memoriam with tags jazz guitar, melvin sparks, prestige records, soul jazz. You can follow any responses to this entry through the RSS 2.0 feed. You can leave a response, or trackback from your own site.